How to download and install League of Legends? Choose your location (EU West, United States, EU Nordic and East, Latin Ameria, Russia, Turkey, Oceania) and click on Download Game. The setup file for League of Legends will be downloaded. Run the setup file and download the game. A League of Legends icon should be on your desktop. Run the game – you should see the login screen and it will prompt you to login to your account. Once logged in, the game will start updating. Wait for it to finish updating and then you can start playing! 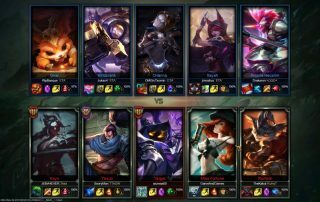 League of Legends, developed by Riot Games, is a free-to-play MOBA game, where the player selects a hero with which to fight the enemy team. Each team has 5 players. You select a certain game role (top, mid, ADC, jungler and support) and play in one of three lanes. Throughout the game, you must kill enemy minions while engaging the opponent heroes and defending your turrets. Killing enemy minions and destroying enemy turrets proved you gold – note that gold is not shared between team members, unlike certain other MOBAs. Your ultimate objective is to destroy the enemy nexus. In League of Legends, players are given the role of a “Summoner” who is in control of a “Champion”—mysterious and powerful humans, animals, or beasts with unique skill sets of their own (there are over hundred in the roster). Players then use the skills of these Champions to battle against other Summoners with their own Champions, usually in a grouped effort of either 3 or 5 players. The objective of a match between these groups is to destroy the enemy center life called a “Nexus” which each team has, present at the ends of the battling arena on which the teams summon and resummons when they die. To reach the enemy’s Nexus, a team must battle through enemy Champions and attempt to destroy enemy Turrets on the way, which fire lasers that deal heavy damage, which defending their side from enemy invasion too. The first team to go through the Turrets and destroy the Nexus wins the match, and team members are rewarded with experience points, from which spells, runes, and masteries can be unlocked. Additionally, each team is equipped with AI ally “minions” a short while after the start of the match, which provides cover from and distraction to enemy Champions or Turrets. League of Legends provides five modes for the players to choose from. The first is the tutorial, which teaches players the basics of the game; the second is called Co-Op vs. AI mode, and is a match setting where 3-5 players are matched against similarly numbered Bot players; the third is called the Normal matchmaking mode, and is used to set up a match between similarly skilled players on both sides; the fourth is called the Ranked matchmaking mode which is similar to Normal Matchmaking mode but requires level 30 to enter, and the final is the Custom Games mode, which allows players to play on any map with custom-arranged player numbers. League of Legends has three very distinct maps. The first and the most popular one is “Summoner’s Rift”, where two teams of 5 players battle each other to destroy the Nexus and are allowed to move between three “lanes” from which to approach the enemy side. The second is called “Twisted Treeline”, and is similar, except it contains only two lanes, and the third is called the “Howling Abyss”, and has a single lane. New maps are added occasionally and somtetimes removed, such as the ARAM map, and the dominion map. League of Legend is a highly-competitive game because a player’s strength is based on their strategy and experience, and such strength can’t be bought with money. Similarly, it also provides players the ability to choose their playing styles thanks to the huge Champion roster: there’s a Champion type for every gamer out there. The fan-base is also very active, and Riot Games is known for releasing regular patches and improving the game at regular intervals, which has kept it going strong, even eight years after its release. The League of Legends World Championships tournaments are one of the world’s largest gaming esports tournaments, with fame and large monetary prizes at stake. League of Legends is a Multiplayer Online Battle Arena (MOBA) video game developed and published by Riot Games for the Microsoft Windows and MacOS platforms and was originally released worldwide for these platforms on October 27, 2009, as a free-to-play game. Since then League of Legends has evolved heavily and has become one of the most-played video games of this generation. It is a free MOBA game, where you can select a character from an ever-growing list of playable heroes.